For Ex: Enter in the format EN023923458MY etc found on your poslaju confirmation receipt! How to identify my POSLAJU Shipment number? POSLAJU Consignment number is a 13 digit numerical number which is generally found on the Top Right corner of your consignment just below the barcode. Most of POSLAJU Consignment numbers begin with 2 letters EN, EM, ET, ER etc and ends with -MY represents for malaysia. If you have a missing or invalid consignment number, Immediately call POSLAJU Customer care at 1-300-300-300. Consignment Dispatch out from Transit Office – Collected at a POSLAJU Hub. Custom Inspection – Inspection being conducted on consignment to perform violation checks. Send to Office –Send to office for delivery process. How To Find Your Poslaju Shipment Tracking Number? STEP 2 – Above Receipt contain a number “EM 017092315 MY” Which is your official POSLAJU TRACKING Number. 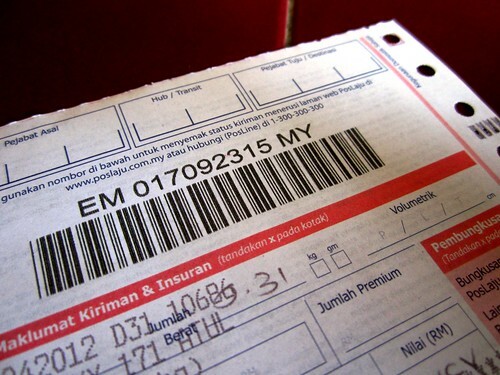 STEP 3 – Copy the receipt number and Visit http://www.trackdelivery.net/poslaju to track your shipment. STEP 4 – Your Shipment status will be displayed based on TRACKING DATA Received via Courier’s Tracker Database. My shipment not arrived since 1.5 months , after tracking with trackdelivery i discover it is on HOLD due to pending fees. Helped me a lot. Need Support? Contact Our Team. TrackDelivery.Net is One of the Top Shipment Tracking Search Engine. Easily track shipments for most popular carries from anywhere in the world. Fetch detailed information about package delivery, issues and easily contact shipment directly! ©2018 TrackDelivery. All Rights Reserved.